Are you looking for a delicious strawberries recipe with a difference? If you are, you’ve found it! Here’s my strawberry & mascarpone tarts with limoncello for you to enjoy. 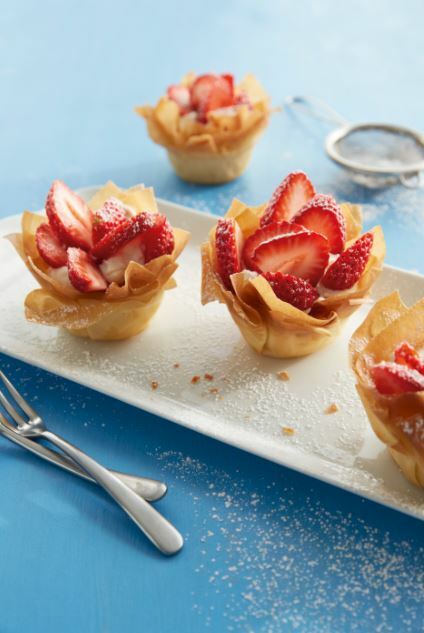 Feast your eyes on the finest strawberry & mascarpone tarts with limoncello! It’s straightforward and fun to make this great dish. Simply follow the instructions below and get the perfect result. Preheat the oven to 180ºC/gas mark 4 and brush 4 holes of a muffin tin with a little of the melted butter. Lay out all the squares of filo pastry. Brush them evenly with the melted butter and sift over 10g of the icing sugar. Sprinkle with the cinnamon. Line each greased muffin tin hole with 4 squares of filo pastry, each arranged at slightly different angles. Press the pastry down into the hole to create a cup. Transfer to the oven and bake for 8 minutes until golden brown and crispy. Remove from the oven and set aside to cool. Meanwhile, put the mascarpone, ricotta, lemon zest, vanilla extract, limoncello and the remaining icing sugar into a medium bowl. Using a hand-held electric whisk, beat until smooth. Put the filo cups onto a serving platter and evenly spoon in the mascarpone mixture. Arrange the sliced strawberries on top of the mascarpone cream and sprinkle over a little icing sugar to serve. 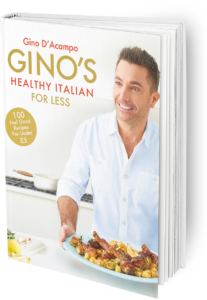 GINO’S TIP: To get the very best flavours from limoncello it must be served really cold. Keep your bottle in the freezer so it’s always ready to use. 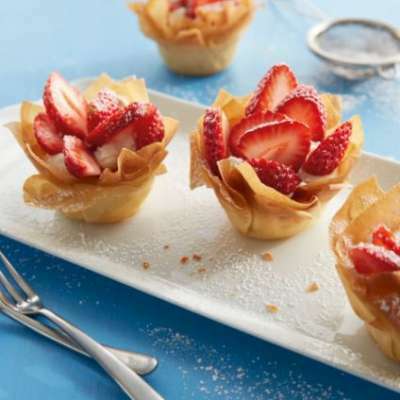 Once you’re done, simply sit back and enjoy your strawberry & mascarpone tarts with limoncello and don’t forget to check out other great authentic Italian recipes including great antipasti recipes, Italian pasta recipes, Italian soup recipes, Italian beef dishes and authentic pizza recipes. I have to admit that I'm not a great lover of beetroot, probably because I don’t particularly like sweet and sour together. This, however, is one of the few ways that I will eat beetroot because it works beautifully with the smoked salmon. If you are a beetroot virgin – here you go, this is the one to try. Make sure that you cook the rostis until they are very crispy. You might be tempted to think this recipe is just posh beans on toast, but to us Italians it’s an important dish, especially in regions where beans are a staple part of the diet.